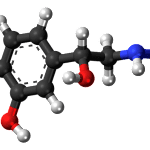 The numerous organic compounds can be grouped into a comparatively small number of series or families of compounds known as homologous series. 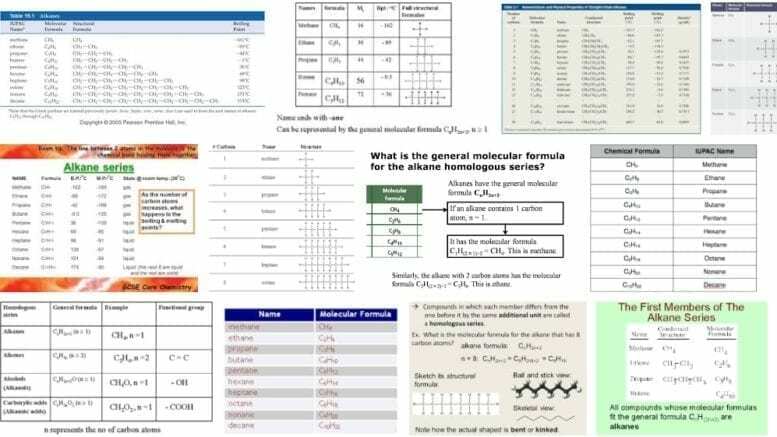 The simplest series of compounds in organic chemistry is the alkanes. We shall study this series to illustrate what a homologous series means. The alkanes are a series of hydrocarbons with a general molecular formula of CnH2n + 2, where n is a whole number with a value of one or more. 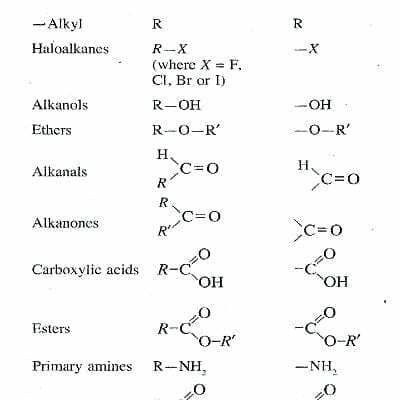 From the table below, we see that each individual member of the alkane series differs from the preceding or the following member by one carbon atom and two hydrogen atoms, i.e. –CH2– group. Such a family of compounds is known as a homologous series and each individual member is referred to as a homologue. A homologous series is a family of organic compounds which follows a regular structural pattern, in which each successive member differs in its molecular formula by a –CH2 – group. Other homologous series include the alkenes, CnH2n, the alkanols, CnH2n+1 OH, and the carboxylic acids, CnH2n+1 COOH. Homologous series have the following common characteristics. General Molecular Formula: All members share a general molecular formula, i.e., CnH2n + 2 for the alkanes, CnH2n for the alkenes, and so on. Difference Between Successive Homologues: Each successive member in such a series differs in its molecular formula by the addition of a –CH2– group and in its relative molecular mass by an increase of 14. 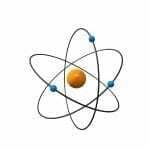 Physical Properties: The physical properties of the members change gradually as the number of carbon atoms per molecule increases. 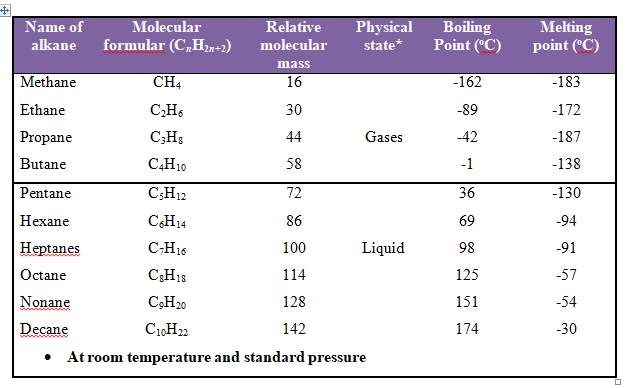 For example, the boiling points of the alkanes increase down the series, so that the first four members are gases at room temperature and standard pressure; members with five to seventeen carbon atoms per molecule are volatile liquids; while the higher members are wax-like solids. Similarly, the melting points and densities of the alkanes also increase, while their solubility in water decreases down the series. 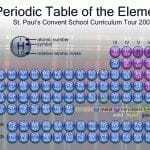 Chemical Properties: The members show similar chemical properties. For example, the alkanes are fairly unreactive under ordinary conditions. They burn in air, forming carbon(IV) oxide and water, and undergo substitution reactions with other substances such as halogens. General Methods of Preparation: All members can usually be prepared by using the same general methods, e.g., alkanes can be prepared by the action of hot soda lime on the appropriate sodium salt of an acid. Many homologous series can be regarded as being derived from the alkanes by the substitution of one or more of the hydrogen atoms by other elements or groups. 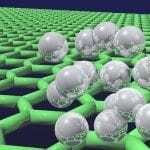 The univalent group which is formed from an alkane by the loss of a hydrogen atom is known as the alkyl group. Thus, the compound that is formed by substitution can be considered as being made up of the alkyl group and the substituent group. For example, chloromethane, CH3CI, is composed of the methyl group, CH3-, (obtained from methane, CH4, by the loss of a hydrogen atom) linked to the substituent chlorine atom. –CI. The general term alkyl group includes all groups derived from the alkanes by the loss of a hydrogen atom. Alkyl groups have a general formula of CnH2n+1. 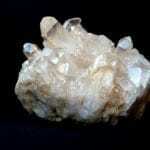 They are named after the parent alkanes by replacing the ending –ane by –yl. Alkyl groups are given the genral symbol, R. sometimes, R may stand for more complex groups than just simple alkyl groups. The table below shows the relationship between the parent alkane, alkyl group and their formula. 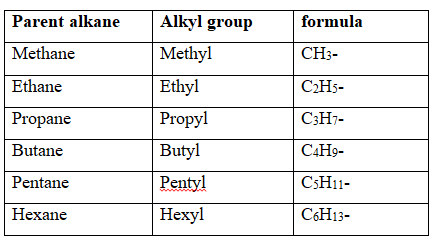 The alkyl groups derived from the first six members of the parent alkane series. The alkyl group of a compound is fairly inert chemically because of the stability of the carbon-hydrogen bonds. The chemical reactivity of an alkyl compound is determined mainly by the substituent group. These groups are referred to as the functional groups, e.g., the hydroxyl group, -OH, the amino group, -NH2, the carboxyl group, -COOH, and the double covalently bonded carbon atoms, C=C. each functional group has its own characteristic properties. When two or more functional groups occur in one molecule, the properties of one are often modified or influenced by the presence of the others. Thus, the presence of the functional group or groups determines the chemical, properties of a homologous series. A functional group is an atom, a radical (group of atoms) or a bond common to a homologous series, and which determines the main chemical properties of the series. The homologous series derived from alkanes. The table above gives the general formulae and specifies the functional groups present in ma y of the homologous series which are derived from the alkanes. The functional group determines the basic chemistry of a compound, while the alkyl group affects the physical properties of a compound. For example, the polar hydroxyl group in the alkanols promotes solubility in water but the non-polar alkyl group opposes it. For all alkyl groups larger than C4H9-, this opposing effect is sufficient to greatly limit the solubility of the compound in water. Be the first to comment on "Significance and Properties of the Homologous Series"